The kind of true crime I like to read is trashy to some people. Everyone's tastes are different in music, literature, clothes, cars, and true crime, too. One man's trash is another man's treasure, literally sometimes. Collectors of murderabilia upset me. I am sure some of them are the nicest people in the world, but I just can not understand the fascination with having something belonging to a killer or from a crime scene in your home. It would feel to much like inviting evil into my house to purchase one of these seemingly prized possesions. Maybe it's my Irish grandma's superstition drilled into my head, or maybe, it's just weird. Letters written by a killer, boards from BTK's home , serial-killer trading cards, t-shirts, actual weapons have been for sale at some time or another. Autopsy photos, you name it, someone has tried to sell it at one time or another. And the amazing thing is, they have been successful! Who in there right mind would want the a drawing by Charles Manson warming their front hallway? And let's be honest, if you walked into your neighbor's home and saw John Wayne Gacy's self portrait hanging over their fireplace you wouldn't high-tail it out the front door quickly? 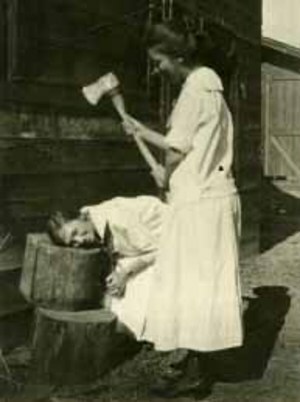 I don't know, maybe I am being too hard on these folks, but I can not possibly see how having the 'proposed' axe that Lizzy Borden allegedly used to chop her family up is going to make my life more fullfilling. Am I missing something? Do others think this practice is acceptable? I have to wonder how the victims' families feel. Do they mind having autopsy photos of their loved ones hanging in someone parlor as a conversation starter? And all I can add is that they're entitled to their personal tastes. For me, I'd love to own Lizzie's axe! The girl-with-axe photo above was found on a website called (I kid you not) Who Would Buy That: Auction Oddities from All over the Web.